In the last epilogue, The Evil Eight are given Navi forms by Dr Wily and were sent to destroy Teletran One. Recently Navi forms were also released for other Robot Masters to download. All the Mechanical Maniacs except Geminiman and Hardman were given one but the Evil Eight struck before they could download them. However using a Pulse Transmission system, the Maniacs were able to enter the net so they could obtain their new forms however Shadowman EXE and Gutsman EXE were quickly defeated by the Evil E ight. Now the rest of the Maniacs continue their search. Warman EXE fires a several bullets at the Mechanical Maniacs causing them to run in separate directions. Needlegal: Great, now I'm isolated. Warman EXE: Don't worry, I'll show you a fun time. Needlegal: I'd rather not stay. Needlegal jumps over Warman EXE and continues to dodge his shots. Needlegal: Gem! What the hell happened? Geminiman: I can't seem to pick up Shadowman EXE but Gutsman EXE just got deleted. Geminiman: I managed to jack him out of the system but it'll take time for him to go back in. Topman: Damn that Spinman! Damn him! I will damn him to the depths of hell! Geminiman: It looks like the rest of the Evil Eight are trying to delete you all separately. Needlegal: Yeah, Warman EXE is kinda chasing me. Meanwhile the other Maniacs are suffering similar problems. Chimeraman EXE: You pathetic reptile! Prepare to meet your doom. Chimeraman EXE fires lasers at Snakeman. Snakeman: Hey Geminiman! I could use some help here. Hardman: Oh yeah, Hardman can smash too! Before Hardman can act, Cleaveman EXE throws Sparkman and Magnetman into Hardman. Cleaveman EXE: They were easier than I thought they were. Geminiman: Guys! All your Navi forms are close by, Needlegal turn left, Snakeman just keep going straight, Sparkman and Magnetman, if look to your right you'll see a fork in the road. Sparkman go to the left route and Magnetman go to the right. Warman EXE: Not so fast! Warman EXE fires a few cannon blasts at Needlegal but she is agile enough to dodge them. Needlegal: I can see my Navi program! Warman EXE: You will not obtain that form! Warman clamps his feet to the ground and begins to charge up the cannon on his head. Warman EXE fires a particle beam at Needlegal as she makes a jump for her Navi form. As the smoke clears Needlegal EXE jumps out and shoots down Warman EXE until he is deleted. Needlegal EXE: Didn't your mother ever tell you it's wrong to attack women? Chimeraman EXE: You will not escape my grasp, reptile! Snakeman: We'll just have to see about that. Chimeraman EXE continues firing lasers at Snakeman while he's running towards his Navi program. Snakeman: I can see it! Chimeraman EXE: Too bad you won't get it! Just as Snakeman grabs the Navi program Chimeraman EXE dives down and swallows him whole. Chimeraman EXE: HaHa! I have deleted Snakeman! As Chimeraman EXE was speaking Snakeman EXE bursts out of Chimeraman EXE and bites off his head, deleting him. Snakeman EXE: Now you know how I feel. Magnetman: Let's see, 2 of them, 3 of us. Hardman: Still they are much stronger. Sparkman: I got a bright idea. Magnetman: If it involves reasoning and making people happy I don't want to know. Sparkman: Why don't we let Hardman hold them off for a while then come back while we're strong to fight back. Hardman: I don't like this. It involves too much work for me. Sparkman: Just hold them off for a while. Golemman EXE: Golem will crush you like ant! Hardman: You know something. You're a golem so therefore you are made of rock. Hardman punches Golemman EXE and he crumbles into rubble. Hardman: I can break rock easily. Cleaveman EXE: But can you stop this? Cleaveman EXE runs into Hardman and knocks him over but before he can do a finishing blow Shadowman EXE appears out of nowhere and cuts Cleaveman EXE in two. Geminiman: Shadowman! What the hell happened? Shadowman EXE: You should know by now. The Shadowman EXE that Clawman EXE destroyed was a hologram. Golemman EXE jumps up and then smacks Shadowman EXE away. Golemman EXE: Golem only scratched! Now Maniacs die! Magnetman EXE appears in front of and behind Golemman EXE and then delete him from both sides. Magnetman EXE: How did you like that. Pretty cool, huh? Clawman EXE: Cool, but not fast enough! Magnetman EXE: Who said that? Clawman EXE darts past Magnetman EXE and deletes him making him reverts back to Magnetman. Clawman EXE: Maybe you should be more cautious. Hardman regain consciousness and then crushes Clawman EXE, deleting him. Hardman: I could say the same thing. A spinning disc flies over Hardman's head and comes back to Spinman EXE. Spinman EXE: Looks like I missed. Topman jumps into the scene and then deletes Spinman EXE with a Top Spin attack. Geminiman: Looks like Topman made it back on time. Ok I'm scanning the area and I can only detect 2 members of the Evil Eight, hold on. Shadowman EXE: What is it? 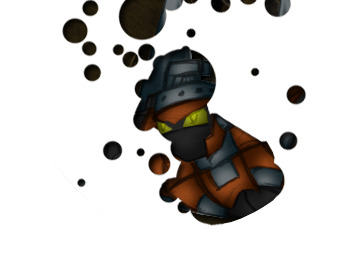 Geminiman: It looks like Artilleryman EXE is moving away from the area. He's heading towards. Oh no. Geminiman: Artilleryman EXE is heading towards the Pulse Transmission program. If he destroys it will delete all of you. Shadowman EXE: Can we make it there before him? Geminiman: Doesn't look like it. Topman: Then what do we do? Geminiman: I'll go in. The rest of you regroup and attack Omniman EXE. Shadowman EXE: Ok, let's go. Elsewhere in Teletran One, Artilleryman EXE was making his way to the Pulse Transmission program. Omniman EXE: Artilleryman! Hurry up, the rest of the team have been deleted. We are to only ones left. Artilleryman EXE: I am nearly there. It won't be a problem. Omniman EXE: Don't be too overconfident. Or you will suffer the same fate as the rest of the team. Artilleryman EXE: Don't worry, I'll be fine. Geminiman: You will not go beyond this point Artilleryman! Artilleryman EXE: Ah, Geminiman. So I guess the rumors are true. You did not get a new Navi form. Geminiman: Don't push me Artilleryman. I can still delete you even if my abilities are somewhat outdated. Artilleryman EXE: I beg to differ. Artilleryman EXE fires a fireball at Geminiman who dodges and returns fire with Gemini Lasers, which Artilleryman EXE blocks with an energy shield. Geminiman: Those boosters are shields as well? Artilleryman EXE: Yes, these 4 jet boosters aren't just for show. They can produce a shield much like your Crystal Shield. However, Dr Wily saw other uses for it and they double as particle cannons! The boosters flip around and aim at Geminiman as Artilleryman EXE begins to take flight. Artilleryman EXE: With this final one attack I will finally destroy you! Once and for all! Particle Beams Fire! The 4 Particle beams fire and combine into one blast, which heads towards Geminiman who blocks it with his Crystal Shield. Geminiman: Damn it! My shield won't last much longer. Artilleryman EXE: The fool thinks that shield can protect him. Artilleryman EXE fires a stun laser that breaks the shield and paralyses Geminiman allowing the rest of the particle beam to hit him. Artilleryman EXE: Hmph, he survived. Artilleryman EXE lands and walks up to Geminiman then points his cannon at him. Artilleryman EXE: This is where it ends Geminiman. Geminiman: I'd look behind you first. Artilleryman EXE: Oh, please I'm not going to fall for that trick. Geminiman Clone: No seriously, look behind you. Artilleryman EXE turns and sees a Geminiman clone behind him who fires a laser through him and deletes him. Geminiman Clone: Nice trick. But you do realise we are completely nailed. Geminiman: I got an E-Can waiting for me when I log out. I have died before so you'd think I'd be prepared for such an occasion. Geminiman Clone: I'm you, so of course I'd know. Geminiman merges back and teleports out of the system. Geminiman: Ok guys, the Artilleryman problem is solved. So have you regrouped? Sparkman EXE: We're altogether like a happy family. Needlegal EXE: So all that remains is Omniman EXE? Geminiman: Well you all managed to delete the rest of the team so I guess so. Topman EXE: I also managed to get my Navi form. Geminiman: Why are you an old man? Shadowman EXE: I suggest that Magnetman and Hardman log out since they are getting rather close to deletion. Geminiman: Ok then. There is an exit point near by. I'll send the location. Magnetman and Hardman receive the information and then log off. Hardman: Whoa! Let's do that again! Shadowman EXE: So where is Omniman EXE? Omniman EXE: I'm right here. The Maniacs turn to see Omniman EXE and fire their attacks at him to no avail. Omniman EXE: Wily gifted me with the Life Aura. You cannot harm me. Shadowman EXE made another slash with the Muramasa and Omniman's Life Aura disappears. Omniman EXE: Curse that attack! But it is not over yet! I still have this shield! Shadowman EXE slashes numerous times with the Muramasa but the shield was unharmed. Omniman EXE: I tire of this. Omniman EXE drives his drill lance through Shadowman EXE and throws him away into the distance. The rest of the Maniacs attempt to hit Omniman EXE but his shield blocks all of them. Needlegal EXE: How are we going to hit him if he's invincible? Topman EXE: Well in his normal form he was weak from a high drop. Snakeman EXE: Yeah, well this is the net, we can't exactly fall into some hole. Topman EXE: That's it! A hole! Topman EXE: Gem! Are you able to create some sort of hole in cyberspace? Geminiman: I might be able to. Why? Topman EXE: If you had eliminate the area Omniman is standing on he'll fall endlessly into the vast areas of the net thus defeating him. Geminiman: Well if I just change a few things here and there, no that didn't work. Magnetman: I thought you were some sort of genius. Geminiman: Hey the technology of this computer is very advanced and delicate it will take time to do this. Topman EXE: Time is something we don't have! Omniman EXE: What a pitiful bunch you lot are! Snakeman EXE: This is getting very annoying now! Needlegal EXE: Maybe now is the best time to ask for a miracle. Zed: Now is the time for a surprise attack! Zed dives down from the roof and drives his sword into the control console of Teletran One. Geminiman: Well I guess that did it. Hardman punches Zed into the sky. Meanwhile, the area that Omniman EXE was standing on begins to crack due to the attack Zed did to Teletran One. Omniman EXE: Was that all you had? I will destroy you all in an instant. Omniman EXE stomps his foot on the ground and spikes shoot out deleting everyone's Navi form turning them back to normal. Omniman EXE: Your efforts are useless. Topman: Not entirely, that last attack has made the ground unstable. And I doubt it will be able to support you now. The ground begins to crumble and Omniman EXE realises what he had done with that foolish attack, before he could try to move off the falling terrain it collapse sending him into oblivion. Topman: And Topman saves the day! Shadowman EXE: And I have solved all our money problems. Needlegal: Where have you been? Shadowman EXE: After Omniman EXE threw me away I was lucky enough to land near someone's bank account. Sparkman: You didn't steal the money? Shadowman EXE: Every last dollar. Sparkman: But stealing is wrong and immoral. Shadowman EXE: Like I care? Snakeman: So we're rich again! The remaining Mechanical Maniacs jack out of the system and celebrate their victory over their rivals. Meanwhile, Wily was infuriated at his loss. Wily: Damn those Mechanical Maniacs! They are always thinking ahead of me! But I'll get them I just need to pay for some more upgrades. Wily tries to order some components of the net but his payment is denied. Wily: That can't be right. I have all the money I need in my account. Wily checks his bank account and discovers it's gone. Wily: No! My bank account! Damn that Gauntlet! Damn him and his stealing ways! Sparkman: Did you just hear that? Sparkman: Sounded like Wily yelling in anger. Magnetman: Nah, you're just hearing things. Hardman: Maybe he had too much to drink. Snakeman: Hmm, I guess everything turned out all right. Shadowman: That stealing always solves our money problems? Needlegal: No we learned that you won't always win if you're technologically superior it all depends on how you use your skills. Topman: Well until Shadowman stops stealing we are the Mechanical Maniacs!